I'm thinking of getting the OEM roof spoiler but don't know what color to paint it. 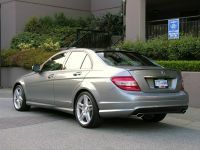 I have a pewter c300 with the pano roof. So do I color-match to the car or go gloss black to match the roof? Thoughts? Suggest you paint it black to match the roof. Here's some photos to help you out. Get black...don't break the lines...and if you haven't tinted it yet and you have pano, tint it. Sounds like black is the color. I do have 35% tints all the way around so the spoiler will definitely match well, not to mention match the black grill. I was just worried that it wouldn't be noticeable with all the other black but those pics really helped prove that worry wrong.